Which Needlepoint Canvas do I need? Blank needlepoint canvas comes in many sizes, colours and types. Are you confused about which one is the best for which needlework project? I'll try to help. Looking for a strong needlepoint canvas that will stand up to everyday wear and tear? Stitching a design in cross stitch or trammed tent stitch? Want to put fine detail in a design like a face or tiny flowers? If so, double thread or Penelope canvas would be an ideal canvas to use. It is woven with pairs of threads going in each direction which enables you to "split" the threads and stitch in between them for the tiny details, whilst using the double threads normally for the rest of the design. You will often find this canvas labeled with two numbers when you buy it; 10/20 or 11/22. The numbers refer to the number of threads per inch (2.5cm); 10 double threads or 20 single for example. Looking for a needlepoint canvas to use for upholstery? 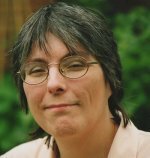 Does your design include any pulled work stitches? 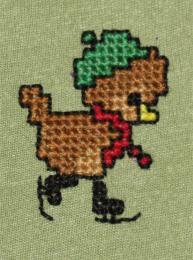 Does your design only use a little tent stitch/half cross stitch? Are you looking to work a bargello design? Have you done some needlepoint before? If so plain single weave or mono canvas is the one to pick. It has a certain amount of give in it due to the over/under weave making it suitable for stitching cushions or chair covers. As long as you don't have large areas of half cross stitch it should keep its shape. Are you a beginner to needlepoint? 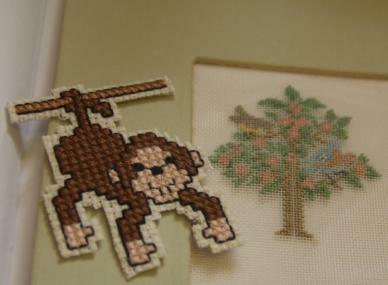 Are you planning to stitch your design entirely in tent/half cross stitch? Do you need a canvas that won't fray? Interlock canvas would be the best choice here. It is constructed of two threads in each direction that are twisted around each other. This makes it more stable and less prone to distortion whilst stitching. It can also be trimmed close to the edge of your project without fraying, making it ideal for stitching coasters and similar projects. Do you want to work a 3D project, such as a box? Do your children want to learn to stitch? Does your project need to be washable? Do you want to cut your project into a fancy/complex shape when finished? Plastic canvas could fit your needs perfectly. It is stiff, therefore doesn't need to be worked in a frame or mounted afterwards. As it is molded rather than woven it can be cut with no risk of fraying. It comes in easy to see counts making it simple to stitch on. Try it out by stitching my free plastic canvas poppies coaster. This one is easy. Do you want to stitch a floor rug but don't want it to take two lifetimes to complete? Rug canvas is available with from 3 to 5 holes per inch. You can stitch or knot a rug on this canvas. Do you want to make a rug or cushion, but for a dolls house? Are you planning to mount your finished work in a brooch? Silk gauze is available with many threads to the inch! I have worked on 40 count. The threads are very fine and you would only need a single strand of fine thread to work on it. It often comes already mounted in a cardboard frame to keep the threads straight and make it easier to use. 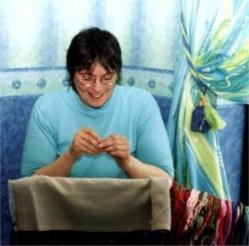 The photograph shows a piece of cross stitch on normal 14 count Aida next to work on 40 count silk gauze. If you want to stitch on an unevenly woven fabric waste canvas is the one to pick. Check the waste canvas page to learn how to use it. Most woven canvas is made from polished cotton or linen threads. It normally comes in white, ecru, yellow or brown. If the design you are going to stitch is worked mainly in pale shades it is best to pick white just in case any canvas shows through. Likewise, for a darker design pick the brown canvas. 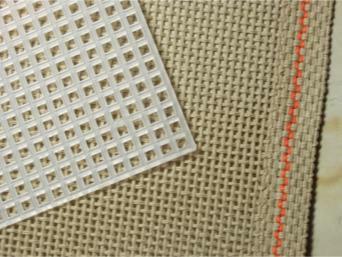 Canvas can be measured in holes per inch or threads per inch which can be confusing. Mono canvas is generally sold in threads per inch. You do tend to get what you pay for with canvas, cheaper pieces can have knots or unevenly twisted threads making them weaker. I hope this helps you choose the right needlepoint canvas for your next project.